Attention Deficit Hyperactivity Disorder (ADHD) is a very common diagnosis seen in a pediatric therapy clinic. It is not uncommon for parents to report difficulty with their child with ADHD and picky eating. The most common complaints for parents of children with ADHD who have trouble with mealtimes are distracted eaters, decreased appetites, and picky eaters. Decrease the external distractions: Eliminate other distractions like the TV or videogames playing in the background, dogs running around, telephones buzzing, etc. Have your child face other family members and face away from the busy kitchen area to encourage attention in the appropriate direction. Require your child to stay in the room and at the table for the duration of the mealtime. Decrease internal distractions: Use solid placemats, plates, and utensils when eating. Colorful patterns or animated pictures can be distracting. Sometimes having a child engage in motor activities before sitting for a meal can help regulate him to be ready to sit and attend for a period. Give the morning medication dose after breakfast to ensure an adequate meal is consumed before the side effect of decreased appetite sets in. Provide proteins during lunchtime and small, healthy snacks during the day. Smaller snack-sized portions are often more visually manageable for children than an entire plate of food. Protein shakes are good options during this time. Serve a larger dinner meal at the end of the day when the drug has worn off. Kids will typically make up many of the calories lost during the reduced daytime eating with a larger evening meal. Consider not using the drug on weekends if your child continues to struggle with this side effect. Allowing one or two days of increased calories a week can counteract for a decreased intake during the weekdays. Kids can be picky eaters for a variety of reasons. Evolution dictates children be wary of trying new things in order to survive. They may have a negative association with eating or have sensory issues causing anxiety with certain foods. Cognitive and developmental disorders also may impact the types of food eaten. Similarly, kids with low tone (i.e., decreased strength, coordination, and postural control) may be picky about the foods that are easier for them to eat. Any of the above issues may co-occur with ADHD. Meal Routine: Too much grazing throughout the day may result in a lack of hunger at specific mealtimes. Three meals and two snacks should be offered per day to ensure hormonal balance triggering “hunger”. There should be a beginning, middle, and end to every meal. Exposure: The best role model for food it you! Having family dinners and presenting children to a variety of foods that you, as caregivers, model eating is a critical way to expose your child to the idea that food isn’t scary. Posture: Ideal eating position is hips, knees, and ankles positioned at 90 degree angles. Boosters/chairs should be utilized to ensure the child is at the appropriate table height. If your child has a hard time remaining in a chair, move-and-sit cushions can provide sensory input to help your child stay seated for a longer. Desensitize: For some children, decreasing the sensitivities of the mouth may help with food intake. Using a vibrating tooth brush, a chewy tube or a washcloth tug-o-war are good options to desensitize the child. Get the kids involved: Taking the kids with you when you grocery shop and letting them help pick out the foods will help with compliance. Encourage your child to help with creating the menu, choosing the foods, and preparing the meal are other ways to help your child become involved in mealtimes. Children with ADHD may have a difficult time with mealtime. Remember to be patient and do the best you can to provide them as many healthy food options as possible. The rest is up to them. 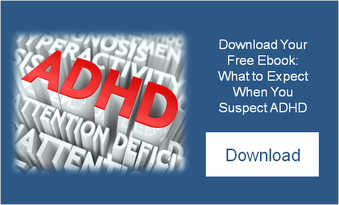 For other tips on how to parent a child with ADHD, click here.